Not that you need a holiday in order to enjoy a tasty cocktail but just in case you do, here is a good reason: Cinco de Mayo! Cinco de Mayo doesn’t mean you just have to drink beer and margaritas all day. 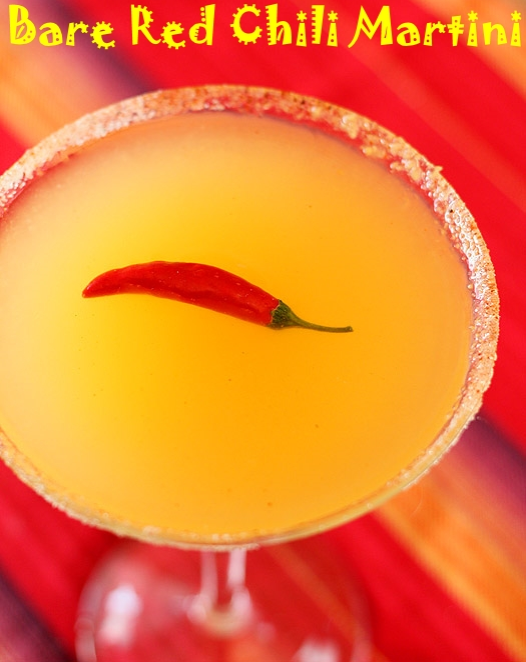 Drink out of the box and try our Bare Red Chili Martini. It’s flavorful, delicious, and refreshing with a little kick at the end of every sip. Even better, its a low-calorie cocktail for those who are watching their figure for the summer season; Bare is ONLY 17 calories per oz. Check out the simple recipe below! Rim glass with some juice from lime and dip in the cayenne salt. Chill glass in freezer. Put all ingredients into shaker; shake and strain into chilled martini glass. Garnish with small red chili. Bare Mixers are a natural, low-calorie cocktail mixer used for margaritas, martinis, and so much more made with only the simplest and freshest ingredients including 100% real fruit juices, purified water, and organic agave syrup. Bare comes in a variety of mixers such as margarita, lemon drop and pomegranate cranberry cosmo that blend well with nearly any liquor or spirit or can also be enjoyed straight up on the rocks. Bare Mixers are free of artificial flavors, high fructose corn syrup, and empty calories. Each mixer is only 17 calories per ounce and 51 per serving, making Bare Mixers a much healthier option than other mixers on the market. I am glad that this cocktail is low in calories, but high in taste. The chili adds spice and heat to it.